The weather is getting noticeably colder as New York approaches the winter months. I’ve been seeing more scarves, more boots, and more unhappy faces as blasts of chilled air smack into unsuspecting passengers departing the subway. One thing comes to mind when I think of the treacherous months to come; a helper of sorts to relieve me of the brutal wind tunnel that is New York City: a hot, steamy bowl of soup. Because the majority of my time is spent behind the walls of The New School University, finding a great place to sit and eat a hearty bowl of goodness is even more appreciated when in close proximity to school. Lucky for me, there is the Japanese restaurant Umami Shoppu: two blocks away from my college, incredibly reasonably priced, and some of the best ramen, sushi, and tempura I’ve had in a while. 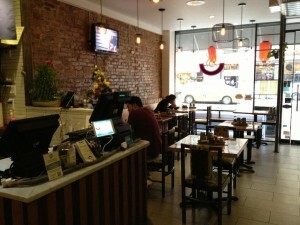 I was immediately met with smiling faces and an incredibly cozy atmosphere upon walking into the restaurant. 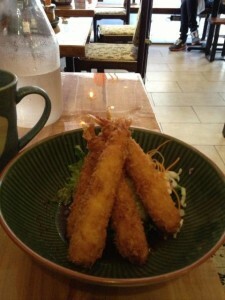 Escaping the cold to enter Umami Shoppu was definitely the right decision. The tables were intimately placed, topped with light blue stone mugs, proper wooden chopsticks (not the splintered set you find in a red wrapper at your local Chinese takeout place), and an array of chili oils and soy sauce. The lighting was calming and the exposed brick gave the restaurant an indie feel while still possessing hints of Japanese culture. As an added bonus, a flat screen television was placed on the brick wall. Playing was a stream of music videos from the late 90’s and early 2000’s. This may just be me, but I couldn’t get enough of the nostalgia felt when listening to some early Britney Spears and Destiny’s Child. Awesome spot for a lovely lunch! 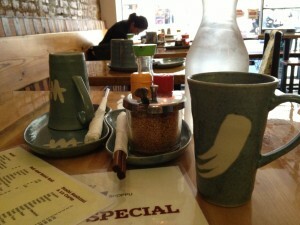 In simpler terms, Umami Shoppu has a unique quality not normally seen in more traditional Japanese restaurants. Opening the store with his father a mere four months ago, owner William Wu took his prior knowledge of Japanese cuisine, specifically from his past work at ramen shops, and created something fun and contemporary while still providing great food. Wu acknowledges and embraces the area that Umami Shoppu is now a part of. When asked his favorite aspect of owning the restaurant, he replied, “Meeting people, all kinds of different people. In fact the show Louis is filming here pretty soon. It’s all pretty cool. I get to meet a lot of college students and it reminds me of being young.” Wu matches this concept to create a youthful vibe that lingers throughout the shop. 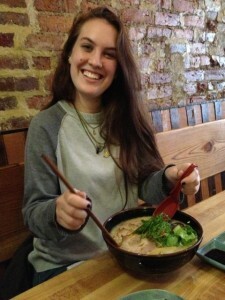 Tyler is loving her ramen! Now for the food! There were so many options, both from a Lunch menu, 11 AM to 4 PM, and a dinner menu. In order to get an well-rounded take of the food at Umami Shoppu, I asked the owner for a few of his personal favorites. He immediately responded with his first choice of ramen and sushi. He recommended the Spicy Butaniku Ramen, great for cold weather, double the pork of most ramen dishes, and a spicy flare to really warm you up. His sushi choice was something he had actually created himself. Named the Autumn of NY roll, this type of sushi had everything: spicy king crab, mango, avocado, all topped with salmon. Damn. As a pesscatarian, the only “meat” I eat is fish; I had to pass on the pork. On the other hand, my companion joining me for lunch was intrigued. She got a rendition of the Butaniku, the Cha Siu Tonkotsu Ramen, the same idea with a little less spice. I myself got the Shrimp Tempura Shoyu Ramen, a soy based broth with a side of some of the best shrimp tempura I’ve ever eaten. We split a large plate of the Autumn roll to begin our feast. While listening to “Hit Me Baby One More Time” and basking in the warmth of the intimate Japanese shop, we happily waited for our meals. The sushi plate was brought out rather quickly. It was a large plate beautifully presented and designed with each piece of sushi placed in a patterned order. With chopsticks in hand, we dove in. Graced with a light spice, the flavor was pretty incredible. Everything was fresh from the crab to the avocado. Plus, there was so much of it—definitely a good choice to share. 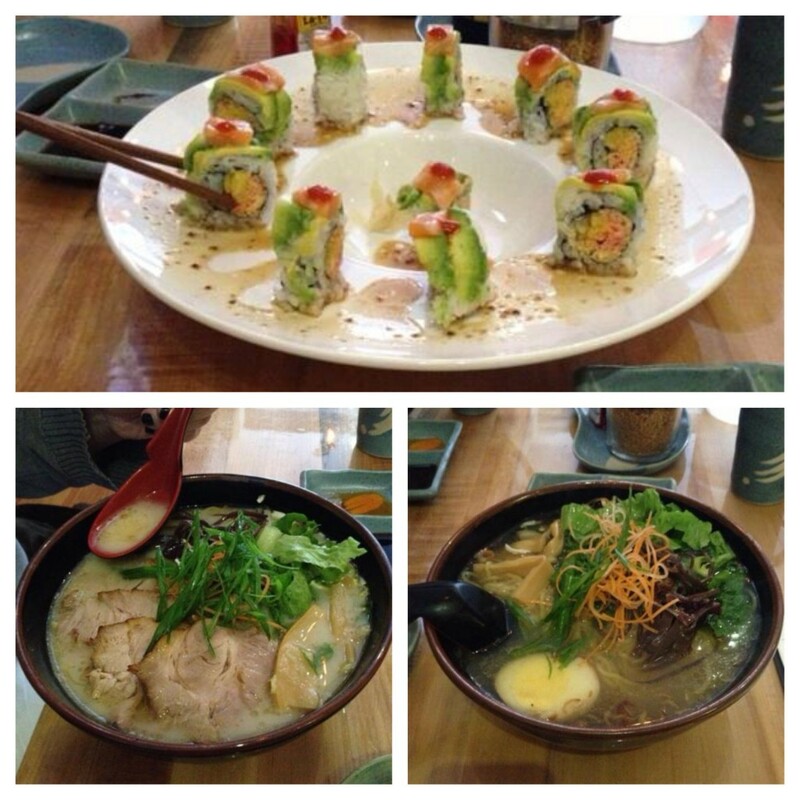 Just as quickly as it had appeared, the sushi platter was devoured and then came the ramen. Both my friend and I were a bit unfamiliar with ramen outside of the to-go cups that have a blend of freeze dried peas and uncooked noodles jammed inside. We were pleasantly surprised. 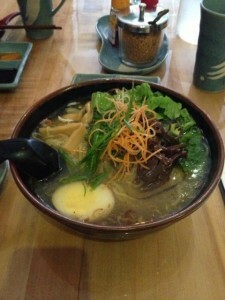 The bowls were ginormous and absolutely filled with fresh, thick noodles, bathing in a steaming broth. The flavor, both for the pork and the shrimp, was tasty and not overpowering. As mentioned before, the tempura was probably the best I’ve ever had—crispy fresh shrimp, and the blend of batter and seafood was delicious. Halfway through our bowls we both admitted defeat. More full than we had ever anticipated, we pushed them away in satisfaction. Featured on Grubhub and Seamless, plus a 10% discount to students, you really can’t lose with Umami Shoppu. As a first time restaurant ramen customer I was very impressed and satisfied with my meal. Being so close to school, I’ll always know the perfect place to go for a warm bowl of Ramen and a cozy environment to take off my gloves and parka. Even better, Wu plans on catering more to vegetarians—now I really can’t say no. Umami Shoppu is the ultimate student hub for good, inexpensive Japanese food, plus we all need a little Destiny’s Child back in our lives. This entry was posted on Sunday, October 20th, 2013 at 6:36 pm and is filed under Cheap Eats, onCollege, onFood, onValues, Restaurant Reviews. You can follow any responses to this entry through the RSS 2.0 feed. You can leave a response, or trackback from your own site.